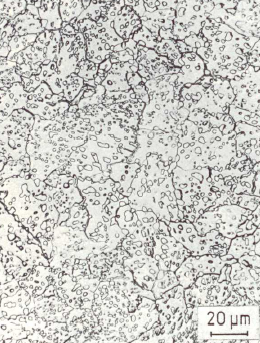 Designation for the most stable iron-carbon compound Fe3C which forms orthorhombic crystals and contains 6.67% of carbon. The phase is ferromagnetic up to a temperature of 215 °C. The designations primary, secondary and tertiary cementite refer to the formation during primary crystallization as well as to the precipitation from the ɣ and α mixed crystal. 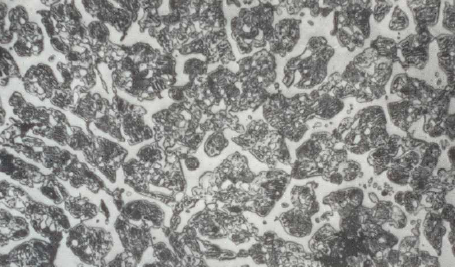 Primary cementite is the cementite formed already during the solidification of the molten metal (figure 1). 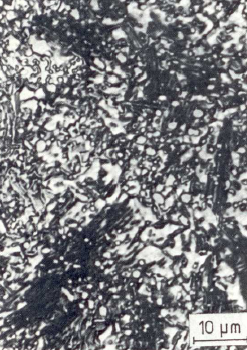 The eutectic of the meta-stable system in the iron-carbon phase diagram which contains 4.3% of bound carbon in the form of 64% cementite is referred to as ledeburite and consists of cementite and austenite (Bild 2). Secondary cementite is released from the austenite with further cooling and can accumulate at the already available primary cementite. It is difficult to distinguish both types of cementite on the basis of metallographic specimens. 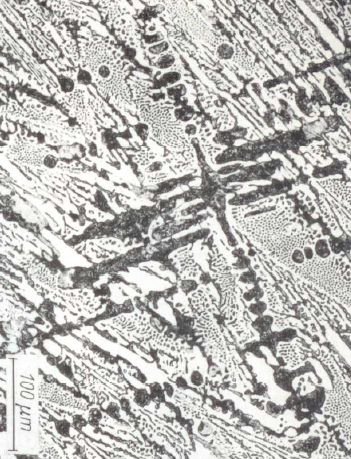 Tertiary cementite (figure 3)is formed as a result of the eutectic decay of austenite (in connection with perlite) in the hypoeutectic range ().